The din inside the Pepsi Centre had reached a crescendo, 13,384 opposing voices at full peal. Yet he might’ve been out in the country somewhere, off communing with nature, watching gentle ripples spread across an isolated lake on a lazy, wind-less afternoon. “Nothing,’’ marvels coach Curt Malawsky, “rattles this guy. “A deflection shot in the fourth quarter goes off a stick into our net, the building’s rocking. That would crush most guys. Not this guy. “I look down the floor and he’s smiling. “His attitude never changes: let’s move on to the next one. “So strong between the ears. Such mental toughness. Ice in his veins, larceny in his heart and winning in his DNA. Just a kid, really, Christian Del Bianco. All of 20. Yet Sunday, the kid and his Roughnecks journey into the belly of another, even more unforgiving, beast, Sasktel Centre in Saskatoon. The golden bauble on offer is a trip to the best-of-three National Lacrosse League final and the chance to claim the franchise’s first championship title since 2009. Goaltending, cliché tells us incessantly, is crucial at any time. Come playoff time, it’s invariably season-defining. Wresting the No.-1 job from Frankie Scigliano, Del Bianco’s minutes soared, from 192 last year to 788. “He’s gotten there pretty quick and he’s still playing junior A this year, coming up. “The learning curve, getting a handle on playing in a bigger net with a smaller stick, he picked up in a very short time. “He plays to his abilities, his athleticism, the ability to not only stop the ball but to pass it and create transition, create goals, for us. Whether it’s in practice, warm-up or a game, he makes saves that just leave you shaking your head or wanting to see a replay to get a better understanding of how exactly it happened. 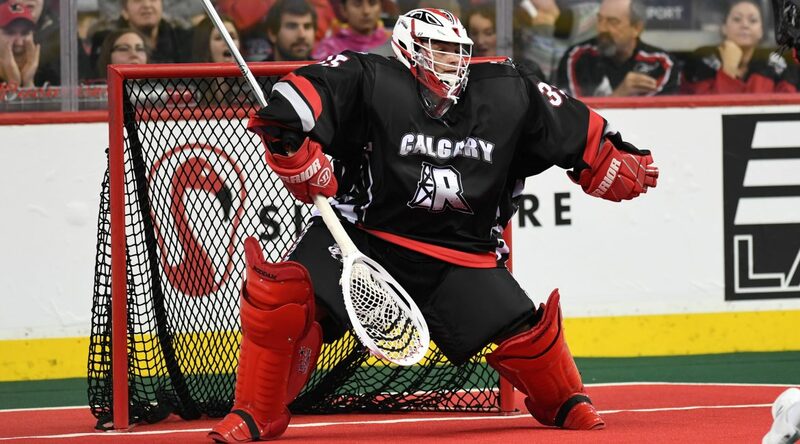 Over the final six minutes and 37 seconds Saturday evening in Denver, the Mammoth attack didn’t get so much as a sniff, the Roughnecks peeling off four straight goals to run out 15-12 winners in the Western Conference semi-final. “Just his demeanour, his mindset,’’ lauds Malawsky, “is what’s so impressive. “You hear the term a lot: ‘Well beyond his years …’ That’s Christian. That’s his biggest asset. When it’s time to lock it down, in the second half, when it matters most, that’s when he’s at his best. Like last game. They go up by one, he gave us a chance to tie it. They go up by one again, he gave us a chance to tie it again. “At no point did he let them go up by two when the game was on the line in the fourth quarter. He kept on giving us a chance. The kid has grown with the added responsibility. “What might’ve gone in on him early in the season,’’ says Malawsky confidently, “doesn’t go in on him anymore. “He’s cut from old-school cloth. He lives and breathes lacrosse. He wants to be out on the floor, playing. Right now in his life, that’s his top priority. You can tell. Saskatchewan represents the NLL’s most potent offensive aggregation, led by the 1-2 punch of Mark Matthews and Robert Church, who combined for 223 regular-season points. The 14-4 Rush also won all three seasonal collisions between the provincial-border rivals, but two of those were by a goal, one requiring OT. And while Sask’s 6-3 record at SaskTel is formidable, it’s far from invincible. “I’m a firm believer that pressure is only something you put on yourself,’’ stresses Malawsky, as game day nears. “Christian’s not a guy who keeps telling himself: ‘I’ve gotta do this on my own.’ He just does his job. He makes the ones he’s supposed and some he’s not supposed to. And the ones that do get by him? Like I said, he just moves on to the next shot. “It could be a Wednesday night in Coquitlam or Sunday, 5 o’clock, jam-packed SaskTel Arena. What’s at stake is a shot at what they all dream of.